The disappearance of Arctic sea ice is a well-documented trend with a well-established cause. But this past summer, Earth scientists were startled to see Antarctic sea ice take a nosedive, too. Now, scientists at the British Antarctic Survey are blaming the event on a spate of freak weather, underscoring how much we still have to learn about what controls ice around the south pole. From September to November of 2016, the ring of ice surrounding Antarctica melted at a rate of up to 30,000 square miles (75,000 square kilometres) per day, faster than any other springtime melt since satellite record-keeping began. 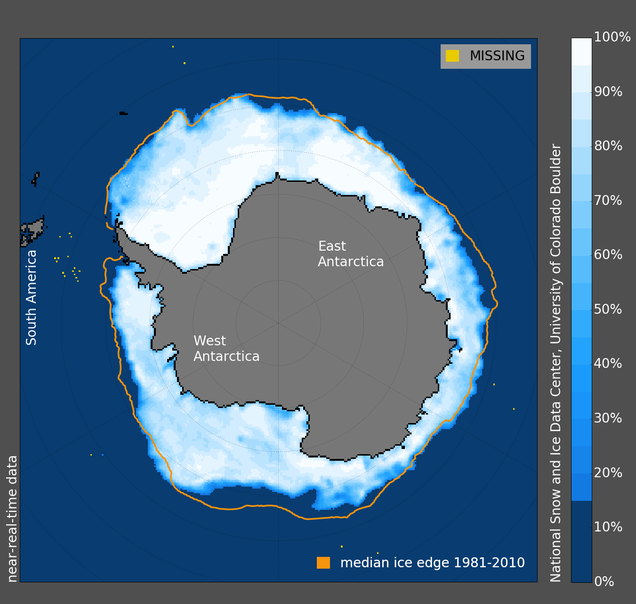 By March 1st, the peak of the austral summer, Antarctic sea ice had shrunk to 845,000 square miles (2.1 million square kilometres), an all-time low. Typically, Antarctic sea ice bottoms out at about 1.2 million square miles, or 30% more ice. This summer’s sudden, dramatic melt had scientists scratching their heads for months. Now, after carefully comparing sea ice trend data with atmospheric circulation patterns, a team of researchers is offering a likely explanation. Writing in Geophysical Research Letters last month, the scientists explain how the sea ice crash coincided with a series of remarkable weather anomalies and storms—beginning, in September, with an extreme low pressure centre in the Amundsen sea off the coast of West Antarctica. In October, strong atmospheric Rossby waves brought additional heat toward the south pole, triggering ice loss in the Ross Sea and Indian Ocean. By November, the Weddell Sea was shedding 30,000 square miles of ice—roughly the area of South Carolina—each day. Cecilia Bitz, a sea ice researcher at the University of Washington, told Gizmodo that the explanation offered in the new paper “sounds accurate,” and matches well with her own interpretation of the sea ice data. Bitz and her postdoc currently have a paper under review, which she described as “entirely complementary and in agreement,” with Turner’s. Explaining weather patterns and climate trends over our planet’s southernmost continent is proving to be an incredible challenge. 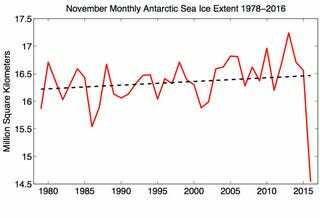 2016 aside, Antarctic sea ice has been slowly but steadily expanding over the satellite record, reaching an all-time high in October of 2014, in spite of the global warming trend. Scientists have attributed this seemingly bizarre expansion to everything from topography to decadal climate patterns to the ozone hole to global warming itself—but the truth is we still aren’t entirely sure what’s going on.